A Long Way Down … and Happy Birthday Mark! 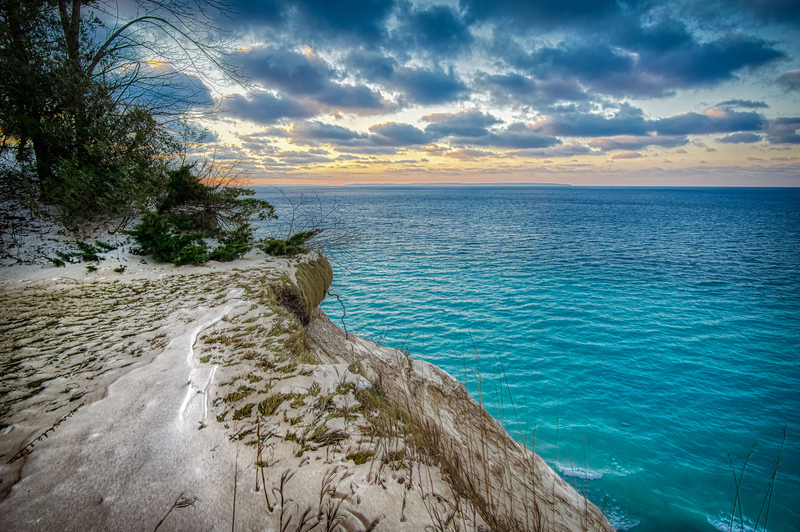 This stunning shot from the Leelanau Conservancy​’s Clay Cliffs Natural Area was taken by Mark Smith. He’s been a big contributor of photos to Michigan in Pictures​ and we’re wishing him a very happy birthday today and hoping Santa brings him all the photography gear his heart desires!! See some of Mark’s best on Michigan in Pictures. Check this out background bigtacular and see tons more shots by Mark on Flickr! an oldie but a goodie for #TBT! Above is a portrait of Elsie Schuenemann at the wheel of the Christmas Ship, near the Clark Street Bridge on the Chicago River in the Loop community area of Chicago, Illinois. The boat carried Christmas trees to Chicago from Michigan. Her father, Captain H. Schuenemann, died when the Rouse Simmons, a ship carrying Christmas trees, sank in 1912. The trees behind her likely came from the woods of Escanaba. Though the story of Barbara Schuenemann and her three daughters carrying on the tradition of the Christmas Tree Ships has perhaps been a little over-romanticized, there can be little doubt that the Schuenemann family and the many others who participated in the difficult trade of hauling Christmas trees south as the storms of winter closed in were heroes cut from a cloth that isn’t found too often today. If you’d like to read more about all the Christmas tree ships (there were many more than just the famous Rouse Simmons) I recommend Christmas Tree Ships from Fred Neuschel. He has also written a book called Lives and Legends of the Christmas Tree Ships (available from UM Press). The National Archive also has The Christmas Tree Ship: Captain Herman E. Schuenemann and the Schooner Rouse Simmons that details the Schuenemann’s story. You can also see Rich Evenhouse’s cool video of diving the Rouse Simmons. Retired from service in 1951, 1225 was sent to scrap, in New Buffalo, Michigan. In 1955, Michigan State University Trustee, Forest Akers was asked by C&O Chairman Cyrus Eaton if the University would be interested in having a steam locomotive (Eaton did not want to scrap the engines but was having a hard time finding places that would accept them) so that engineering students would have a piece of real equipment to study. Forest Akers thought it a good idea and proposed the idea to University President John Hannah. John Hannah accepted the gift of the locomotive. When he told the Dean of the College of Engineering about the gift, the Dean said that Engineering was not interested in an obsolete locomotive. John Hannah then called up Dr. Rollin Baker, director of the MSU Museum and told him that he was getting a locomotive. The C&O then instructed the yardmaster at New Buffalo to send an engine to the Wyoming Shops for a cosmetic restoration and repainting with the name Chesapeake and Ohio on the side. The 1225 was the last engine in the line, i.e. easiest to get out. It had nothing to do with the number representing Christmas Day. Baker received the gift of the locomotive in 1957 when it was brought to campus. The locomotive remained on static display near Spartan Stadium on the Michigan State campus in East Lansing, Michigan for a decade. While on display, a child by the name of Chris Van Allsburg used to stop by the locomotive on football weekends, on his way to the game with his father. He later stated that the engine was the inspiration for the story, Polar Express. Lots more information about riding the train and the rest of their collection at the Steam Railroading Institute and more about the book right here! View Charles’ photo bigger on Flickr and see more in his Steam Engine, Railroad Photos album.